The Queen bedroom shares a bathroom with the Twin bedroom, so can be used for a family of 4. ie. 2 adults + 2 children. TV and WIFI to all rooms, Desk and 2 comfortable chairs. Reverse cycle air cond. Use of laundry, iron , fridge and dryer. Continental Breakfast is included in tariff. Tea and coffee making in the Laundry for all day drinks. Comfortable Queen bedroom with its own ensuite, flat screen television, WIFI and desk and comfortable chairs. reverse cycle air cond, Tariff Includes a continental breakfast. Tea and Coffee making plus a Fridge in the laundry, iron & ironing board. Free parking . Plenty of extra pillows and blankets. Electric blanket for the chilly nights. The Homestead Bed and Breakfast Guest House was built for Bed and Breakfast in 1998. Each Bedroom is quite large,and has a Queen bed or 2 King size single beds, a settee, bed side tables, desk and a large walkin wardrobe, also tea and Coffee making in each room and a fridge in the laundry which is for the use of guests and TV and Foxtel reception in each room. We only have 3 guest rooms,for 6 people, so we have time to pamper each guest..
Well Behaved Children are very Welcome and I do have a cot and highchair for babies. We can pick you up from the Bus station or train station, at Warnbro Station. We can also arrange car hire from a local car hire firm if you need one. Homestead Bed and Breakfast includes a guest lounge / sitting room, a dining room, and an outside patio overlooking a lovely large back lawn. In the laundry, guests have use of the fridge, washer and iron. We also supply tea and coffee making facilities in the laundry for all day drinks. We are opposite a park and close to a large playing field / oval if you’re feeling energetic! If you would like to bring in takeaway food, you are most welcome to use the Dining room or outside area (please no eating meals in the Bedrooms). The local takeaway food shops include – Curry to Go, Masta Pasta, Chinese, Fish and Chips and Eagle Boys Pizza, and all just 2 minutes drive away. We also have the major fast food outlets including McDonalds, Subways, KFC, Hungry Jacks etc. Unfortunately we have no cooking facilities for guests, as we are not licensed or insured for guest cooking. 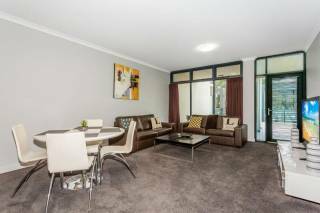 We are a 5 minute drive to the main Rockingham centre and beachfront. If you are heading to the beach we can provide you with beach towels – all you have to do is ask! The Town of Rockingham was first settled in 1850 and has now grown to 85000 people. We are known as the "More than an Aquatic playground",Rockingham has some of the best beaches in Perth, for safe, calm, shallow waters and we have award winning beaches. There are 5 world class Golf courses around the area and you can always get a game or two. The Baldivis Karnup wine trail is well worth a visit, the Wines are as good as the Margaret River Wines. There are Top class Restaurants on the Rockingham Beach front, so you can enjoy a great meal and watch the dolphins play or watch the war ships going to Garden island. Point Peron is a great walk, and was once a main observation post for a World War II coastal battery. The lookout at the top provides great views of Cockburn sound and the Shoalwater marine park, made mostly of Volcanic rock. It’s a lovely walk along its rocky shores, and makes for a great day out. It’s only a short 5 minute drive and a ferry ride to see the fairy penguins at Penguin Island. Other trips from Penguin island are the Penguin and Seal Island cruise, or a Dolphin watch cruise. They also have ‘stand up paddle lessons’ on large surfboards, which looks great fun if you have the balance, or you can take a Sea Kayak tour to the various islands in Shoalwater marine park. Check the website for more information (www.penguinisland.com.au). You can swim with the Dolphins from Rockingham jetty, which is a very popular and great day out. Even if you’re not the strongest swimmer, the wetsuits keep you buoyant, so there’s no chance of drowning! The dolphins often bring their young to interact with the swimmers. For more information check out (www.dolphins.com.au). For a different alternative, you can visit Lake Richmond, which is a 40 hectare freshwater Lake and home to endangered Thombolites – living rocks. The lake has an abundance of birdlife with over 100 species being recorded. We have some fine wineries with 10 minutes of Rockingham, so there is no need to travel to the South West to enjoy a wine tasting! We have some beautiful, sheltered and safe beaches around the Rockingham area, with Warnbro and Safety Bay beaches having both won awards for the best metropolitan beaches. 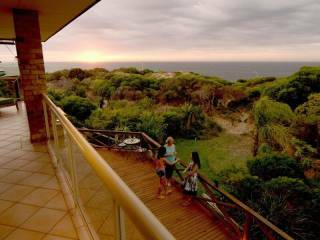 Safety Bay and Warnbro beaches are renowned for there great Windsurfing, Kite Surfing, Snorkelling, Swimming and Diving. Rockingham has over 40kms of magnificent open water to explore for scuba divers or snorkellers of all ages, and some of the best sailing ground in the world, powered by the famous Fremantle doctor (afternoon sea breeze)! You can even dive on the Saxon Ranger dive wreck or just explore Point Peron. We also have plenty of great Golf Courses around Rockingham which are all open for public use. If you’re into motor sport, you’ll find the Motorplex Speedway and Drag racing circuit close to Rockingham. Skydiving has just recently come into the area – why not get a birds eye view of the beaches and Shoalwater marine park, before landing on the beach at Rockingham! For something different to check out, Land Yachts and Blokarts are making a big hit on the huge salt lakes, which are located just near Warnbro Station. Also nearby is Aqua Jetty, which has an Inside and outside pool, plus a Gym, Sauna and steam room. There is also a large selection of restaurants opposite the sea front on the Rockingham Beach foreshore. Watch the Sunset whilst enjoying a great meal or drink! Cycling Around Town - Our council have given us some great duel purpose cycle ways from Port Kennedy all the way round to Kwinana beach – about 20kms, just make sure you have Bell on your bike! Shopping Centres - The main Rockingham shopping centre is at the corner of Council ave and Read street, offering a variety of over 200 different shops and cafes. Waikiki Village shopping centre is on the corner of Read street and Gnangara road, Waikiki, and Warnbro Fair shopping centre is on Warnbro Sound ave, Warnbro. There are also a number of IGA stores that have late trading hours. If you would like further information or local knowledge on tours around WA call Rockingham Visitor Centre on 9592 3464 - the staff are very helpful. Check in time is after 2.30pm unless other arrangements have been made prior. If travelling with a small child, Homestead would appreciate knowing beforehand. Even better second time around, really looking forward to visit no 3, thank you for looking after us again. From Henny and Ali Van Puyenbroek,Vict Thank you both for a great time. Your friendlyness made it most enjoyable. wonderful BnB we were very welcomed we will have good memories. Cancellation policy, 72 hours before check in . There are no cooking facilities at Homestead Bed and Breakfast, due to Insurance and shire regulations. Other wise Kwinana freeway south, turn off at Safety Bay road and 8 klms to roundabout, Read street and warnbro sound ave, go across roundabout and 1st road left is Palm drive.